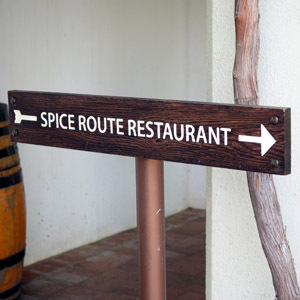 Spice Route offers a quality winelands experience that the whole family can enjoy. Just a short 40 minute drive from Cape Town, down the Suider Agter Paarl Road on what used to be Seidelberg, is Charles Back’s Spice Route - right next door to his popular Fairview. The farm has undergone a number of exciting changes since my last visit, making it a true ‘destination’ as opposed to a mere wine farm with a restaurant. Let me say this now: One needs to put aside a whole day to explore and absorb all that the location has to offer. The kitchen at Spice Route Restaurant is run under the skilled direction of Chef Marion Kumpf, who’s been with the farm since August last year. Her talent and love for cooking with spices make her position at the farm a seamlessly natural fit. And although her menu focuses on them, the food is by no means ‘spicy’. After nibbling on fresh bread with sweet carrot and cream cheese spread, a playful amuse bouche of calamari in a sweet beer basting with pesto, awoke our appetites, gearing us up for the feast ahead. Guests can look forward to flavours that are fresh and light, like the Asian-style yellowtail ceviche with sesame seeds and watermelon salad with crisp baby greens and toasted almonds. Marion’s food is understated yet speaks volumes - with each plate being flawlessly balanced in terms of presentation, flavour and texture. Mains include a popular Cape Malay vegetarian bobotie (R112), Fresh line fish rice paper spring roll (R132) and a meaty dish of Chalmar beef medallions served with bell pepper and chevin roulade, grilled vegetables, crispy potato sticks and Bearnaise sauce. (R144). The Grilled ostrich fillet is also a popular choice (R136) which takes on more of a Mediterranean influence as it arrives topped with Mozzarella, tomato and aubergine compote, Portuguese potatoes and rocket pesto. Portions are generous making it a worthwhile and value-for-money experience. In order to save space for the next stop on our Spice Route journey, my partner and I decided to forgo dessert and instead indulge in a formal chocolate tasting at the nearby DV artisan chocolate studio. However if you cannot resist a little something sweet, be lured by the mango basil crème brulee (R49) or order a portion of the passion fruit cheesecake that comes with a waterblommetjie and strawberry salad. - A brewery tour and craft beer tasting at the farm’s on-site Cape Brewing Company. - A laidback ‘Barley & Biltong Emporium’ where you can kick back, take in the views and relax with an icy craft beer and a selection of kudu, beef and springbok biltong. - Red Hot Glass – a Venetian-style Molten glass blowing studio where each piece - with its mesmerising colour and shape, is distinctively unique. Visitors can watch the glass-blowing production and purchase items on display. To see our gallery of pics, click here. A day-trip with the family, lovers of artisanal products and chocoholics!